Install the Java Runtime Environment (for example, JRE 1.7.0_67). It is not necessary to set any environment variables. 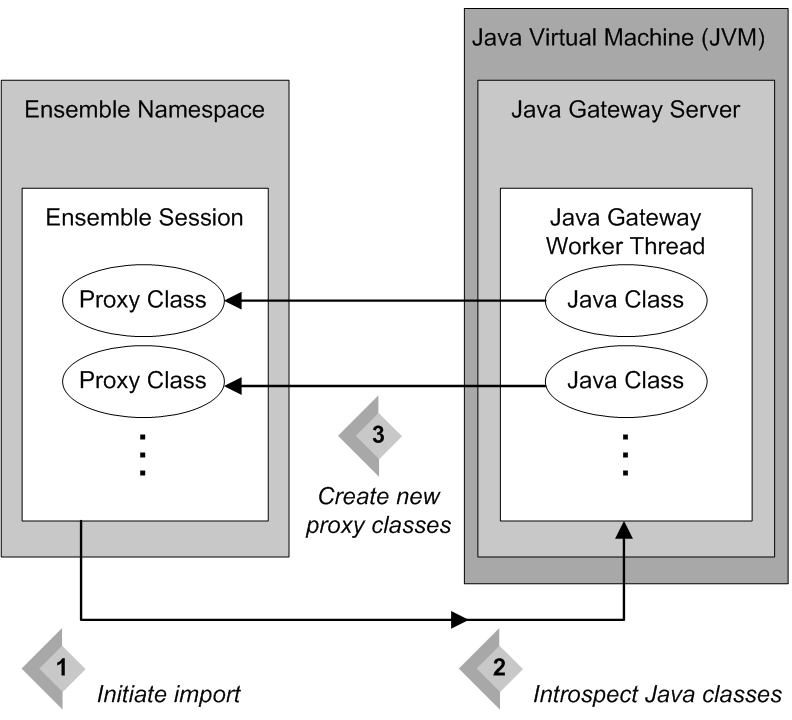 To access the JVM, Ensemble uses information contained in the production. When using the Java Gateway with an Ensemble production, it is a good practice to have the production start the Java Gateway server at production startup, and stop it at production shutdown. This happens automatically if you add a Java Gateway business service to the production. 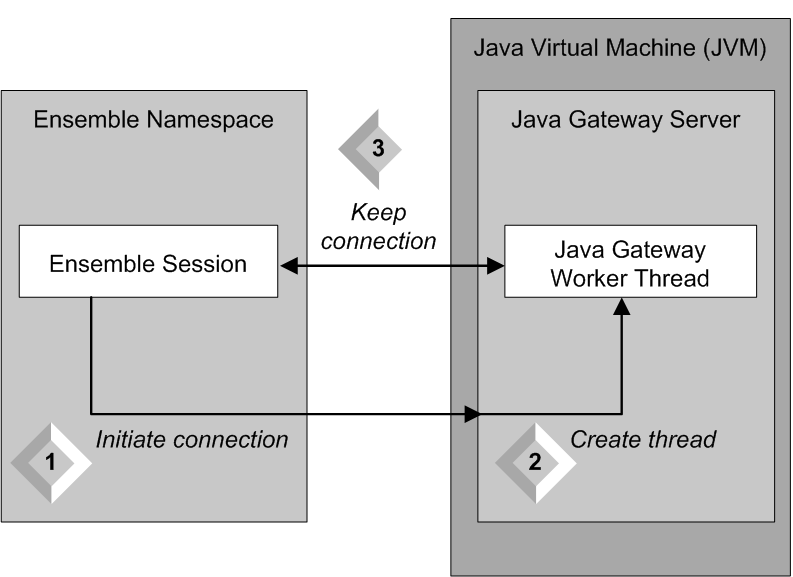 Once the Java Gateway server is running, each Ensemble session that needs to invoke Java class methods must create its own connection to the Java Gateway server. You can connect Ensemble with the Java Gateway server by calling the ConnectGateway method of the business service, or by calling the Java Gateway API %Connect() method. Caché Basic or ObjectScript code sends a connection request. The connection between this Java Gateway worker thread and the corresponding Ensemble session remains established until it is explicitly disconnected. Caché Basic or ObjectScript code that establishes a worker thread must explicitly disconnect before exiting. Otherwise, the assigned port for the connection stays in use and is unavailable for use in other connections. Caché Basic or ObjectScript code can disconnect its thread by calling the Java Gateway API %Disconnect() method. Proxy Object Mode  Allows you to statefully manipulate Java Objects from within Ensemble. Stateless Service Mode  Allows you to make simple calls to Java methods and return the results from within Ensemble. Proxy Object Mode provides an easy way for Ensemble to interoperate with Java components. It allows Java Gateway to instantiate an external Java object and manipulate it as if it were a native object within Ensemble. The external Java object is represented within Ensemble by a wrapper or proxy class. The proxy object appears and behaves just like any other Ensemble object, but it has the capability to issue method calls out to a Java virtual machine (JVM), either locally or remotely over a TCP/IP connection. Any method call on the proxy object triggers the appropriate class method inside the JVM. You can use the Java Gateway to create proxy Caché classes for custom Java components. However, the most powerful feature of the Java Gateway is that it easily creates proxy mappings to entire Java interface specifications, such as the Java Database Connection (JDBC), Java Message Service (JMS), Enterprise Java Beans (EJB), Java Connector Architecture (JCA), etc. Ensemble can use this mapping to work with any implementation that is compliant with one of these specifications. In general, the best approach to using the Java Gateway is to build a small wrapper class that exposes just the functionality you want and then create a proxy for this wrapper. This makes the API between Ensemble and Java very clean and eliminates many potential issues dealing with how to map more esoteric features to a proxy object. 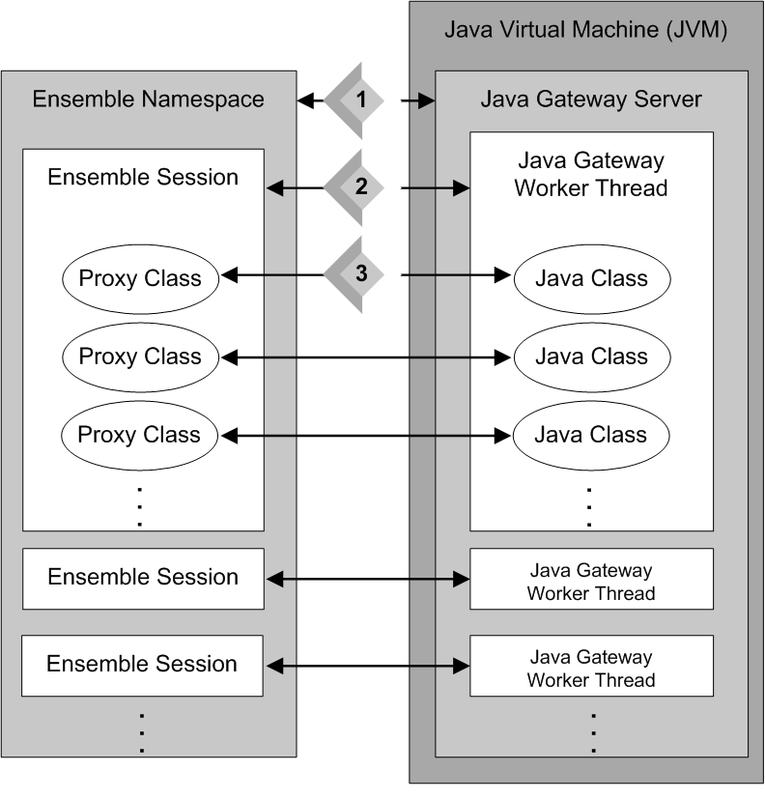 The following diagram provides a conceptual view of Ensemble and the Java Gateway at runtime while using Proxy Object Mode. Later sections in this chapter explain how these commands work to set up Ensemble proxy classes for Java code, as well as how the proxies work once these relationships are set up; see Proxy Call Sequence for details. The Ensemble session sends an import request. If it finds any Java classes that are new or changed, or that have no proxy classes on the Ensemble side, the thread generates new proxy classes for them. All Ensemble proxy parameters are marshaled onto the wire. This is a very simple process in the vast majority of cases  parameters are simply written into the output TCP/IP buffer. A message is sent over the TCP/IP connection to the Java Gateway worker thread. The message consists of the method name, marshaled parameters and, in some instances, other minor load. The results of the method invocation (if any) are marshaled onto the wire and sent back to the Ensemble side over the same TCP/IP channel. The Ensemble proxy consumes the response; any return values are unmarshaled and the method call returns. response corresponds to the Java service result. arguments and result are represented as %Strings on the Caché, and byte arrays on the Java side, meaning any values serialized as such will be accepted by the underlying engine. The implementation of Java service should never include a callback to Ensemble as this newly added component is not designed to be reentrant.